Viva La Venus is a female fronted rock band from North Carolina formed in the late nineties. Their first album came out in 2001 entitled ‘The Never Ending Mending Story’ and landed the band a record deal. The follow up ‘Forget The Fairy Tale’ in 2005 bought them attention on a national scale. 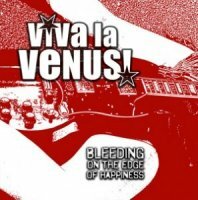 ‘Bleeding On The Edge Of Happiness’ is their third release. The opener ‘Little Voice’ has a traditional Americana feel with bouncing bass and picked notes until mid verse the full electric bursts forth with a grinding progression. Venus adds to this American feel with the aptly named ‘Burn’. Acoustic and soaring guitar gives the feel of a desert road and the heat rising as the sun bears down. Another power chord composition fills the chorus before reverting back to the scorched melody. The western nod is pushed further with the country styled ‘Hole’. Delicate vocals over acoustic guitar and a plodding rhythm wouldn’t feel out of place on any country record. As the chorus approaches the pace picks up a couple of steps before the power six string enters the fray. The band also has some more aggressive songs scattered about like ‘Grave’. This is the only song featuring any male vocals and has a real crunch to the guitar with the majority of the song feeling a little grunge like. ‘Hesitate’ takes a wailing six string approach over a deep chugging riff; this soaring melody feels very Thin Lizzy but with some fatter rhythm underneath. The heaviest song is ‘Leave’ where the lead bounces all over the top of this chunky riff making this the most guitar fuelled examples of Venus and proves the girls can rock when they choose to. Despite showing some potential this is an ordinary album. In terms of sound you could say this has the flavour of Heart with a little Jovi and Lizzy chucked in. With no listing it’s not easy to tell which vocalist is singing. They all have a classic soft rock sound but none of them are as strong vocally as many of the current European singers. If you have a penchant for powerful vocals this won’t have the kick you’re used to. The guitar work is probably the high point of the album with all the players showing some ability when given the chance; again it’s not possible to pick one person out not knowing who was playing when. If the album is average musically, sadly the production can only be described as rather poor. It has the sound of a demo or something home recorded which comes as quite a surprise given this is the group’s third album. A better technical approach might have helped bring out the vocals and music more giving this a better listening experience. Whilst this might show some promise occasionally, the advice for the majority of readers is to check this out online first and see if it does more for you than it did for me.